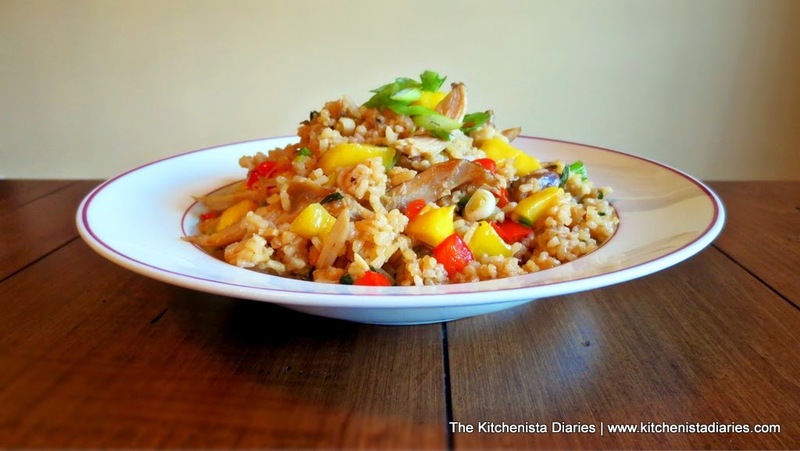 Fried rice is one of my favorite stir fry dishes to prepare when I have leftovers to use up. 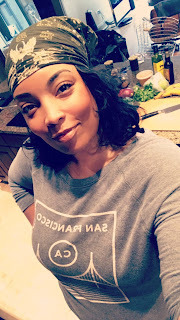 I'm not going to say it's super quick, because the prep work can take longer than the actual cooking process, but it's not something that takes all day either. I actually love the work though. 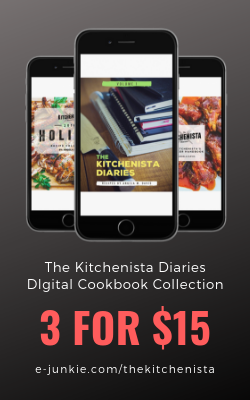 It's the kind of dicing and chopping that can become almost rhythmic and soothing in nature if you allow the process of cooking to take you away from the stresses of your day. I made this for a tasty lunch but it can easily be dinner or a nice treat for yourself on the weekend instead of ordering takeout! 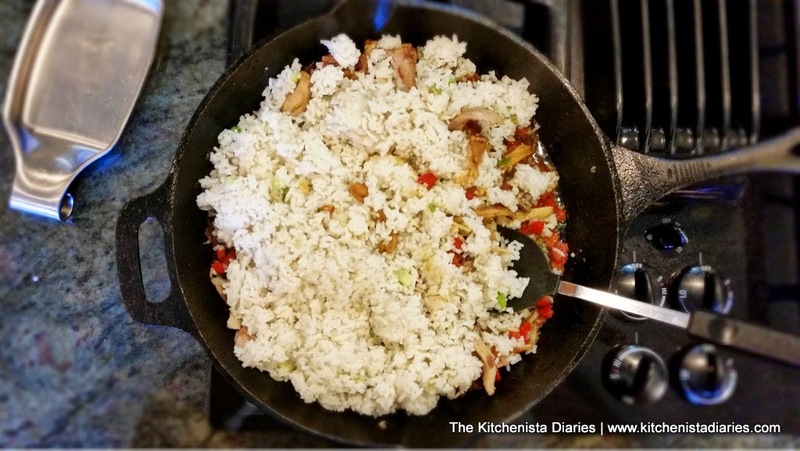 The process itself was a no-brainer as I'd already worked out a formula in my Shrimp Fried Coconut Rice recipe. 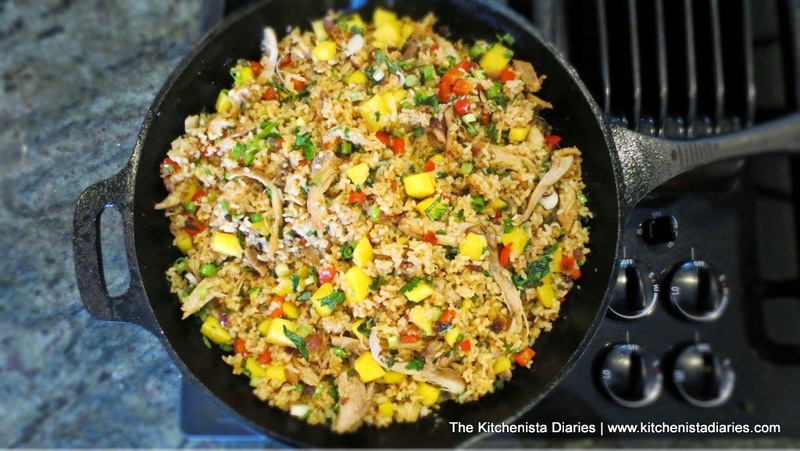 Here, I switched out a few of the veggies and utilized last night's coconut rice and some roasted chicken thighs for a quicker turnaround. 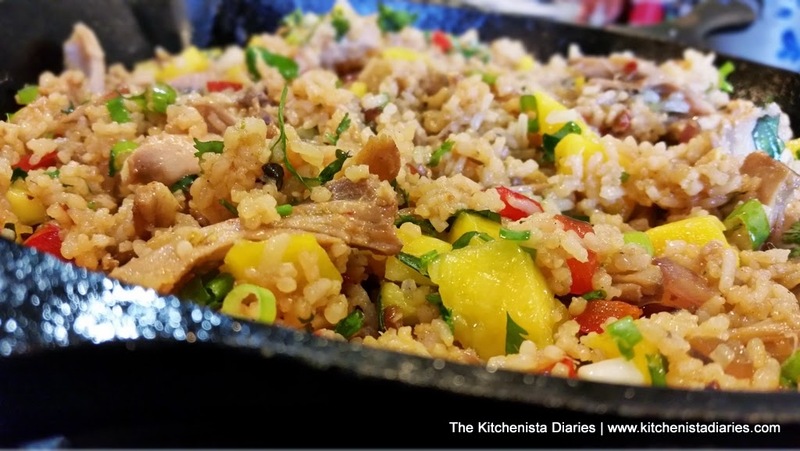 Mango gives the coconut rice even more of a tropical Thai-inspired flavor, but pineapple would also be great with these flavors! You would also be fine to use plain cooked Jasmine rice if that's your preference. Pantry ingredients are important here, so if you haven't yet been convinced to keep these Asian staples on hand I hope this recipe convinces you! 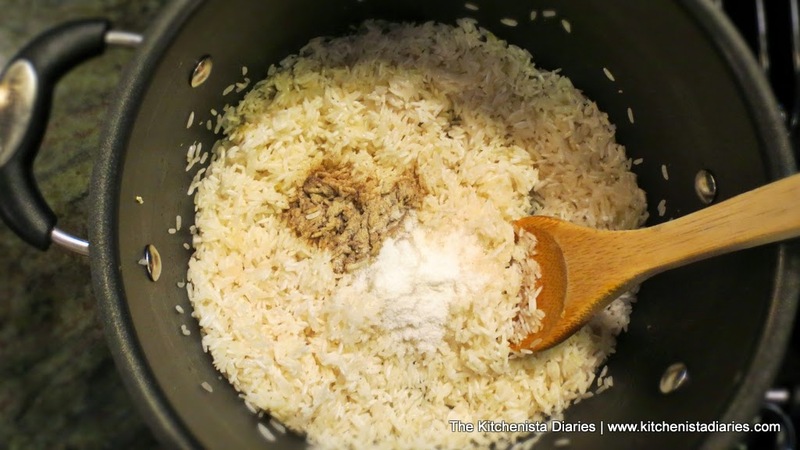 Prepare your rice the day before to make things easier. 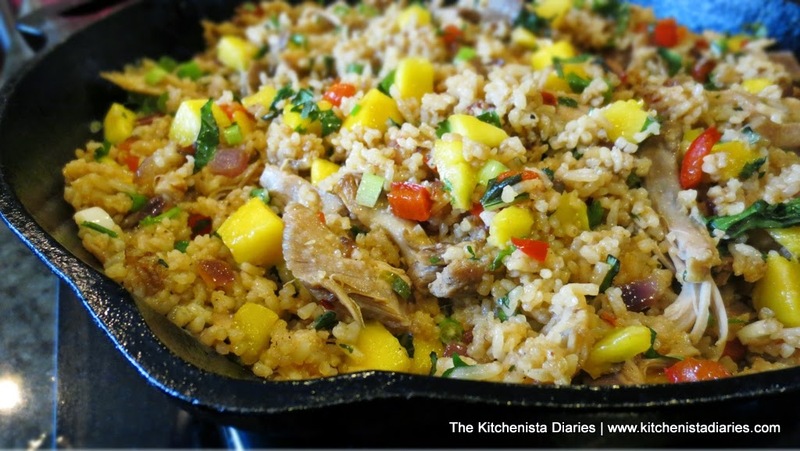 If you're desperate to make this the same day, cook the rice and spread it out on a baking sheet. Transfer to the fridge and chill completely before using. 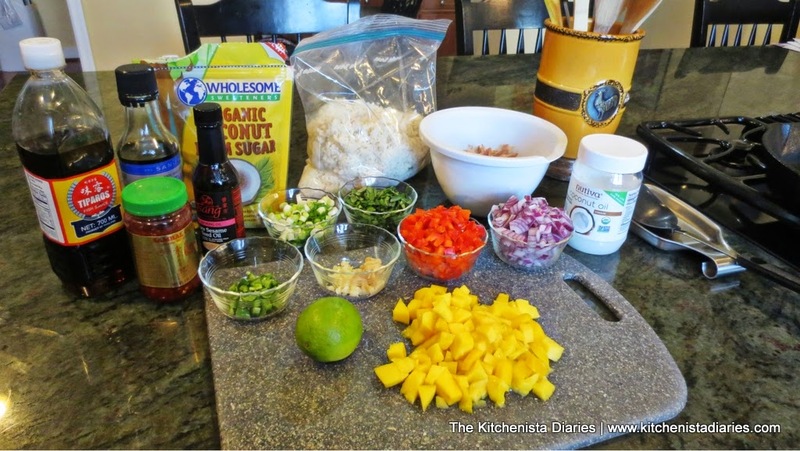 The most important step with any stir fry recipe is getting your ingredients prepped and organized. Things will move really fast once you get going so you don't want to be scrambling to find anything. 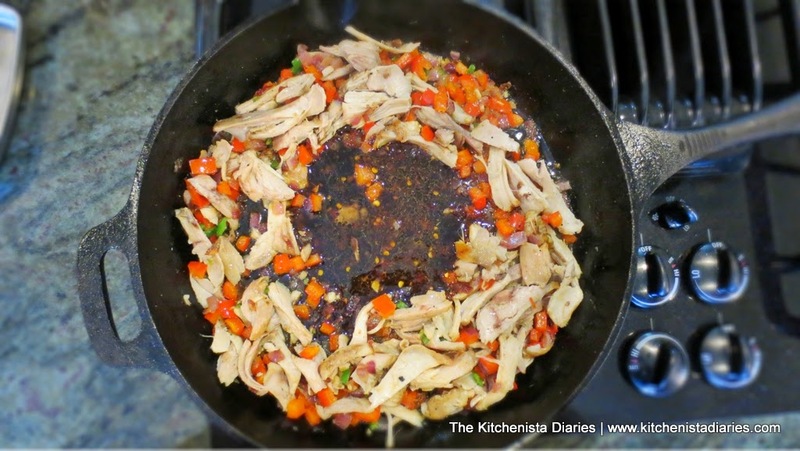 Preheat your skillet or wok over medium high heat. 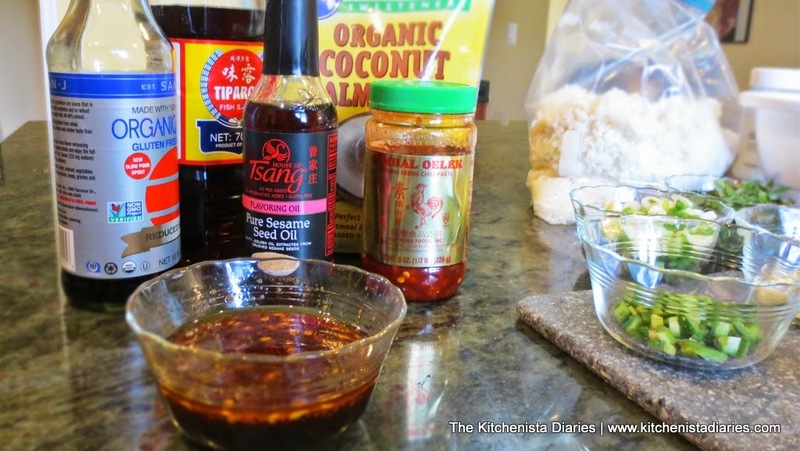 To make the sauce, combine Tamari (or soy sauce), fish sauce, sugar, sesame oil and chile paste. Sambal Oelek is my new spicy addiction! 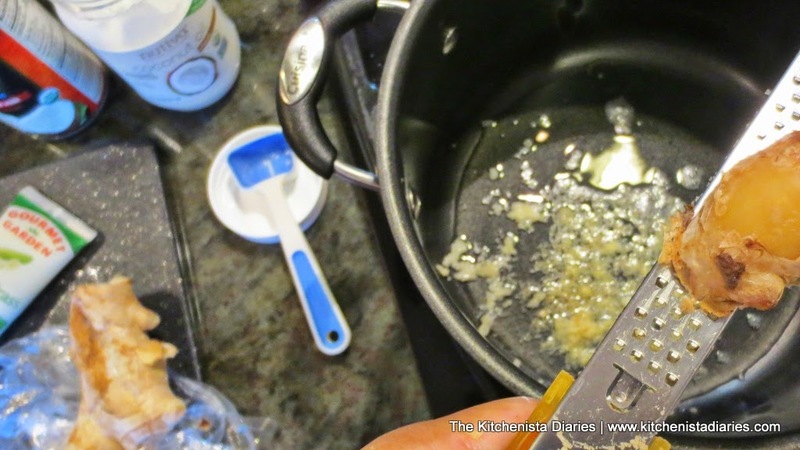 A couple teaspoons here adds just enough heat for balance, but won't make your dish spicy. I recommend waiting until you taste the finished dish to see if you want to add more. 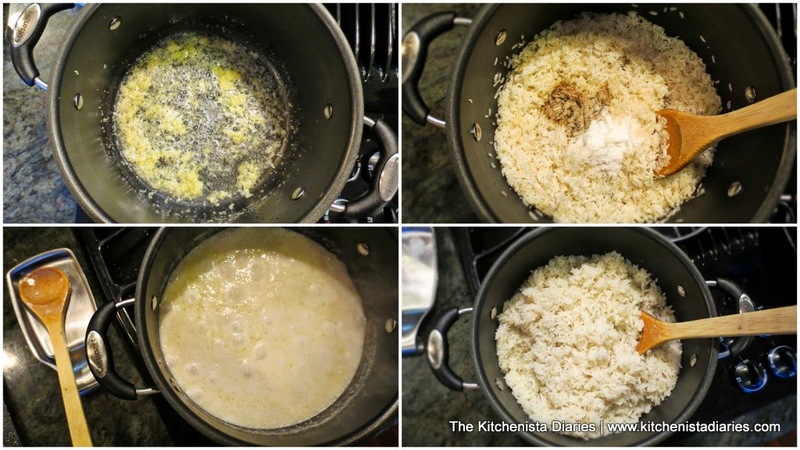 Once your skillet is hot, melt a couple tablespoons of coconut oil. 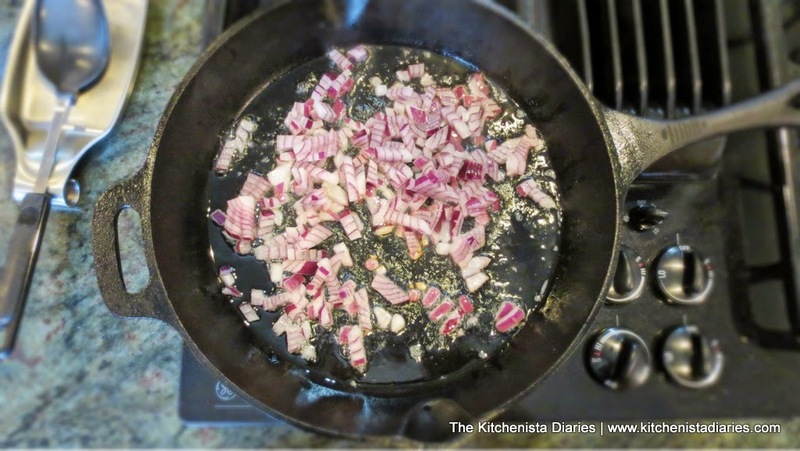 Add the diced onions and cook just until they soften, 3 to 4 minutes. 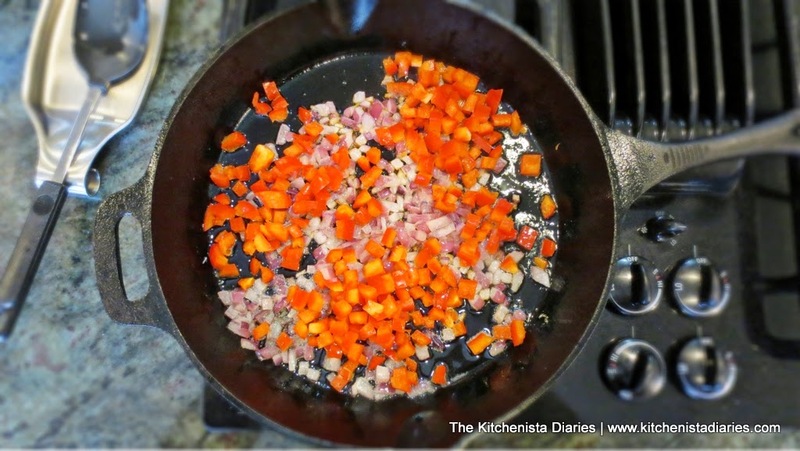 Add the diced bell pepper and season with a pinch of salt and black pepper. Cook for another couple minutes until peppers soften. 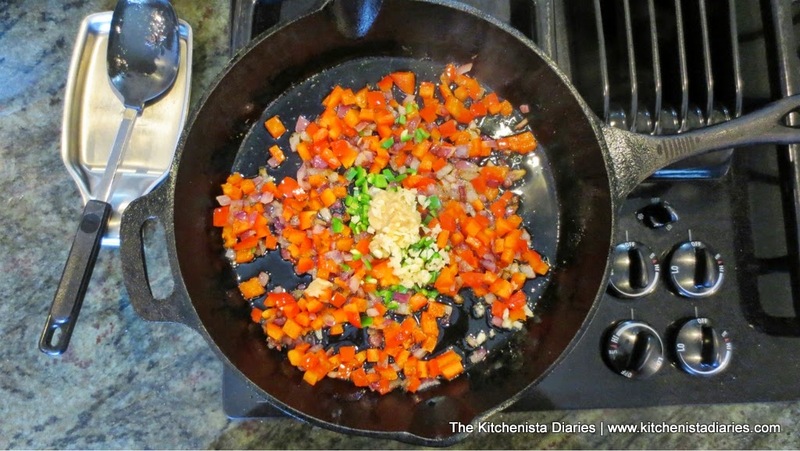 Add the garlic, ginger and jalapeno. Saute until fragrant, about a minute. 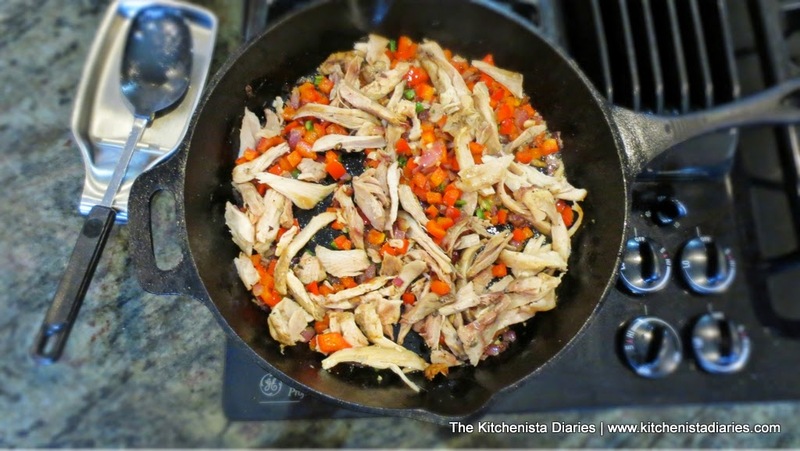 Add the shredded chicken to the skillet and saute just until heated through, 1 to 2 minutes. 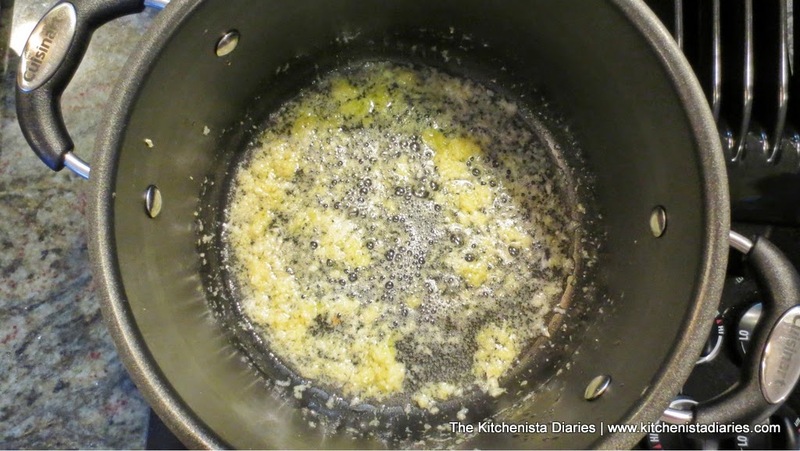 Add another tablespoon of coconut oil at this point if your skillet is dry. 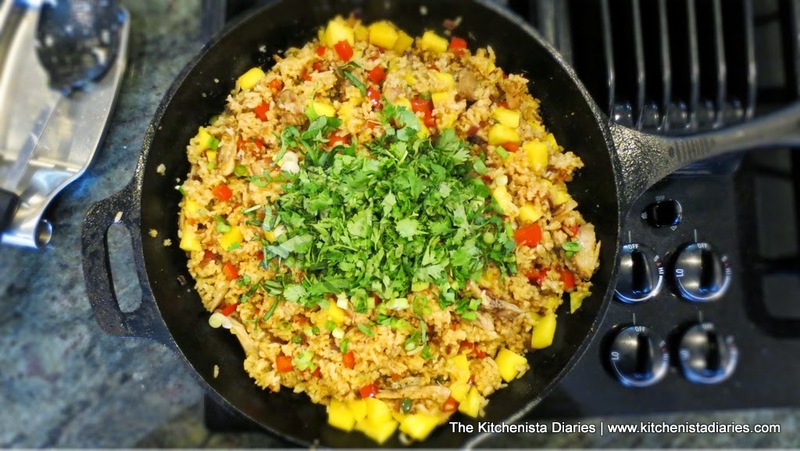 Move everything to the sides of the skillet, creating a well in the center. 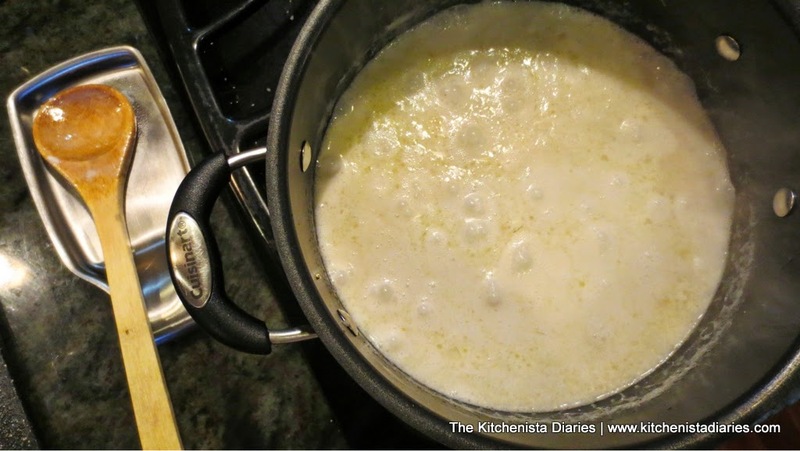 Pour in the sauce and cook until the mixture begins to bubble, about a minute. 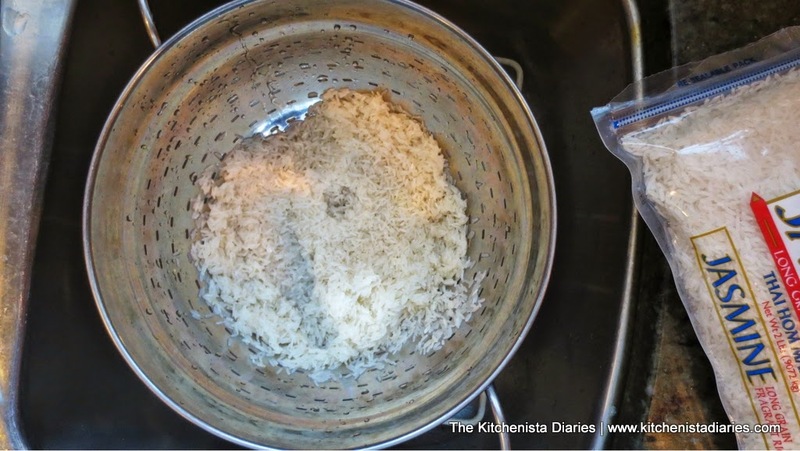 Add the 4 cups of cooked rice, breaking up any clumps. 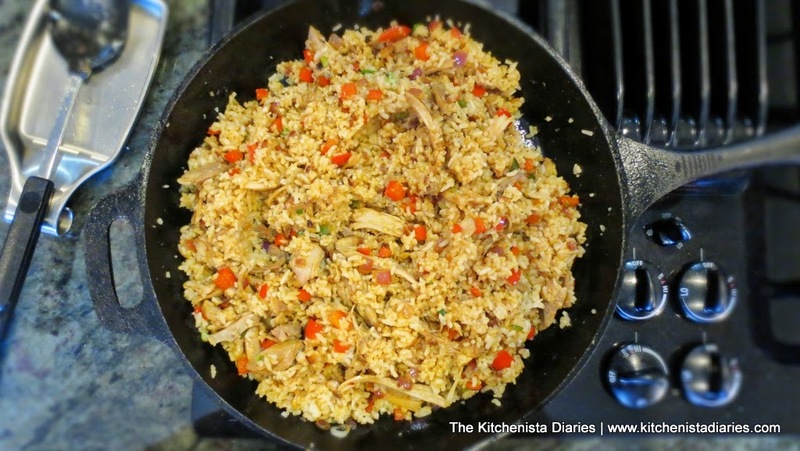 Continue stir frying, letting the rice build up a little bit of crust on the bottom for a minute before stirring again. 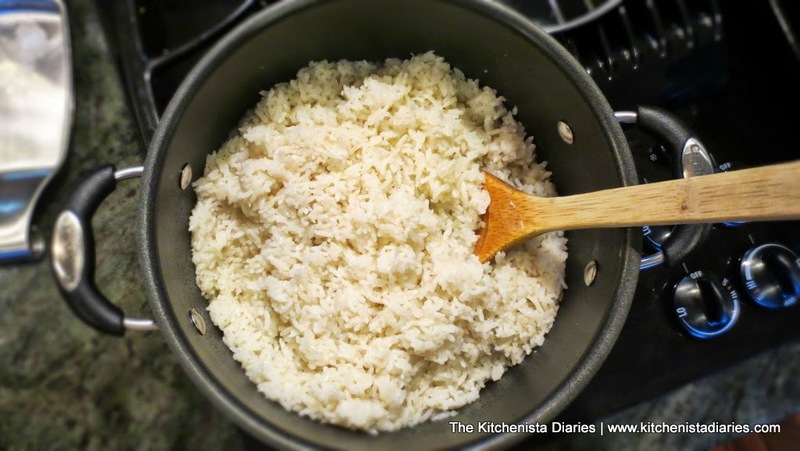 Do this a few times until rice is hot and evenly coated with sauce, 2 to 3 minutes. Turn off the heat and stir in the fresh herbs, scallion, and mango. Check seasoning and if necessary adjust soy sauce or chile paste to taste. Serve hot and enjoy the tropical flavors!